A Cardboard Problem: My "Job"
Sometimes work just isn't work. For the last 10 years I've made my way in the world as a sports reporter. I first worked in New York mostly covering high school sports writing about the kids that would one day become future stars. So far, the only one to make it from those days is Ray Rice, who plays for the Baltimore Ravens. Now, I work in New Jersey writing about college-aged players during the school season and the Philadelphia Phillies during the summer. The summer, as you can imagine, is my favorite part of the year. Last year, I got to travel on the road during the playoffs with Philadelphia. My newspaper normally covers the home games during the season because it's a lot of money to send us on the road. The reason I'm writing about this is because sometimes I forget how good I have it. I am currently covering a game, but it's not even close to baseball. 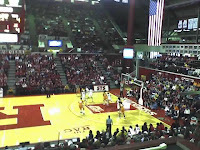 Rutgers women vs. Tennessee. It's a rivalry. It can be fun, but it's women's college basketball and as a woman, I can't even get into it. (The picture of from my camera phone. You might be able to see C. Vivian Stringer down there). I also have a plan that one day (hopefully soon) to use my skill in more than just this blog to write about baseball cards. A lot of my writing here is stream of consciousness and doesn't flow as well as my published articles. One day it will all come together. I write sports for a newspaper, too! (although I'm mostly an editor now). I write periodically on my blog about the baseball players I've talked to (including one today, coincidentally). I can definitely relate to covering sports being a job when it's not baseball. I used to cover Division I college football. I spent two whole seasons puzzled about how into the sport everyone was. It did nothing for me. Down here in Aggie Land (or University of Texas land depending), college football is king. Except for a short while when I had friends who went to Penn State, I've never been interested in college football. I was at this game. Tough loss for the Scarlet Knights. Chris, I know. I actually got more into it as the game got closer. For those wondering, Rutgers blew a 20-point lead at the half and lost 55-51. One thing about enjoying sports is that you can get into just about any game if it's good. I will say this though. I would take women's college basketball over the NBA. I can't get into the NBA at all. As an embittered former media member turned vociferous media critic, I wish I could feel the same way. Maybe if I had made it into sports like I dreamt, and not been mired in regular old news things would be different. But for me, reporting the news was never an encouraging thing. Working in the news was never an encouraging thing. It was full of back-biting, self-absorbed, attention-starved, undereducated talking heads. And it broke my heart because I thought for sure that's what I was meant to do. But I'm stoked that you find joy in doing what many sports reporters feel is a less-than-stellar assignment. When I put things into perspective, most of my assignments become fun. While I mostly cover colleges, last week I spent three days covering a high school basketball tournament. I enjoyed it because the best part about high school kids is their honesty and love of the game. Eventually, all that is gone with what college should I go to, what shoe should I endorse and how do I get more money? The only thing that I have not enjoyed is car racing. I really can't get into it, but I make the most of it because I could always end up pushing paper somewhere instead of sitting near a track with ear buds in.